I struggled with my weight for many years; although I was never obese, I considered myself portly and always had a sense of shame and embarrassment regarding my weight. Nothing I tried worked – exercise, diet, training programs – and it became a vicious cycle in which I would attempt something new to lose weight and when it didn’t work I became depressed and began eating more and exercising less. Eventually I found myself eighty pounds away from my target goal, something that should have been easily maintained by somebody my age and height. When I finally did get back on track with my weight loss I was able to shed the “fatty fat” fairly quickly but was stuck with love handles, thick thighs, and a pudgy belly I could not get rid of if my life depended on it. That was perhaps the lowest point of my weight loss journey – after working so hard for so long, I was left with this body? It didn’t seem to matter how many miles I ran or how many carbs I eliminated from my diet, my belly and thighs would always jiggle. I’ll admit, I was skeptical of Trouble Spot Nutrition at first. It seemed like way too simple of a program when I was used to counting calories and entering information into apps on an hourly basis about how active I was being throughout my day. I was still dubious of the potential results when I purchased it but decided it was better than doing nothing. I am eternally grateful for the decision to purchase it anyway and nothing has changed my life more than this program. I read about hormone imbalance causing so-called “trouble spots” that don’t disappear regardless of exercise and calorie reduction – with every new piece of information I learned, I thought to myself, “So that’s why nothing has been working!” Not only did I become informed about what was really going on with my body, I learned why my weight loss journey had been so frustrating. Even better, I learned what I could do to make it much more effective without pouring in much more effort. In the program, holistic nutritionist Janet Hradil explains that the “fatty fat” that is easy to lose is warm, squishy, and doesn’t have the appearance of cellulite. The stubborn fat, however, feels cooler, harder and denser, and is accompanied by cellulite and dimples. I checked myself in the mirror according to these descriptions – bingo! I had a little fatty fat to lose, but most of the fat on my body was the stubborn kind. Hradil goes on to explain that the stubborn fat is a result of hormone sensitivity and imbalance. What a relief! I finally had an explanation and I finally had a plan other than cardio, cardio, and more cardio. There are three phases in the program: deactivate, target, and activate. I saw changes in my body in the very first phase and they continued through the final phase. 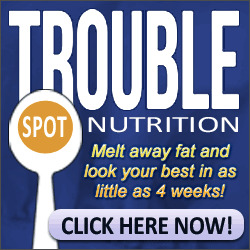 Nothing, and I mean nothing, has been as effective as the Trouble Spot program! This was the answer to my prayers. I changed my diet according to the phase instructions and the trouble fat seemed to fall right off my body. I no longer had to kill myself at the gym – though I still worked out regularly – and even more importantly, I no longer was ashamed to look at myself in the mirror. For the first time in years, maybe ever, I didn’t look away from the mirror when stepping out of the shower and I didn’t run to cover myself with a towel when getting out of the pool. This program was a perfect fit for me after years of struggling to drop the weight and nothing came even close to being as effective. If you are having weight issues, you need this program immediately!